Naomi Rose Coleman Chapman went home to be with the Lord on March 19, 2019. 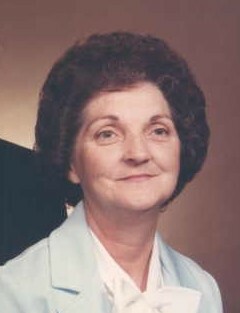 She was a devoted member of Liberty Baptist Church. Naomi was born in Athens, Tennessee but lived for most of her life in Wartburg, where she raised her children and doted on her grandchildren and great grandchildren. Although Naomi worked for a time at Red Kap Industries, her life’s work can be seen in the family she built and the care and love she showed them. She loved nothing more than to rock a baby while she watched her stories and her children, grandchildren and great grandchildren are better people for it. She will be remembered for her kind smile and unconditional love she gave to those around her. Naomi is preceded in death by her loving husband, J.D. ; daughter, Janice Chapman Beach; son, John David Chapman; sisters, Norma Honeycutt, Harriett Crowder and Kay Black; special sister-in-law and friend, Juanita Barger. She is survived by her children, Dr. James (Cynthia) Chapman and Lisa (Matthew) Sexton; beloved daughter-in-law, Lisa Chapman; son-in-law, Tom Beach; grandchildren, Stacie (Donnie) Bradley, Angela (Tom) Denzler, Renee (Wayne) Hammond, Travis Chapman, Thomas Beach, Eric Chapman, Jessica Chapman, Elizabeth Chapman, Hannah (Clint) Smith and Sara (Blake) Barnes; great grandchildren, Justin, Olivia, Madison, Max, Amelia, Emma, Kaylee, Brennan, Jamie, Chloe and Peyton; siblings, Ruth (Acton) Ratledge, Thelma McNutt, Nelson (Frankie) Coleman, Joe (Donna) Coleman, Donald Coleman, Carolyn King, Joyce (Burt) Alford, Peggy (David) Burger, Phyllis (Roy) Jackson and Johnny (Harold) Markland; sister-in law, Barbara Chapman; caretakers, Kim Currier and Nikki McCoig and a host of nieces and nephews. The family will receive friends Saturday, March 23, 2019 at Liberty Baptist Church in Wartburg from 1:00-2:00 p.m. with the funeral to follow at 2:00 p.m. with Dr. Paul Frick officiating. Interment will follow in the Liberty Church Cemetery in Wartburg. Schubert Funeral Home is in charge of the arrangements for Naomi Rose Coleman Chapman.